A mandala is an Indian word from the Sanskrit language meaning a circle. It represents the universe and the balance between heart and mind. A mandala may contain various shapes within it but the structure in the end is a concentric circle. The distance between the middle and the end of the mandala design is always the same. It is designed to be aesthetically pleasing so as to capture the attention of the observer. Mandalas are usually used for meditation by yoga practitioners who focus on Anuttarayoga tantra. This kind of yoga by focusing on the mandala explains how to achieve enlightenment by focusing on spirituality. Annuttara yoga is great especially in the pursuit of knowledge that usually resides within us. The whole point of a mandala is to see ourselves within the shapes and seek guidance as we work our way through the design. Mandalas are represented in the major religions, Christianity, Hinduism and Buddhism. The windows in catholic churches usually have the more common rose design with scenes showing the trials and victories of the saints. Mandalas are also shaped like the celestial bodies in our skies, the sun , moon and planets. This gives them spiritual significance and making mandala tattoos for great for men who focus on spirituality as way of life. Mandalas are subjective and every person has a different experience when they view one. The end goal though is to calm the mind and silence the incessant chatter. Mandalas represent the individual journey everyone has to go through to get to their destination. Mandala tattoos for men are very popular for various reasons, the first being that they are visually appealing. The intricate designs draw you in and keep you glued. The mandala is a meditation aid after all. 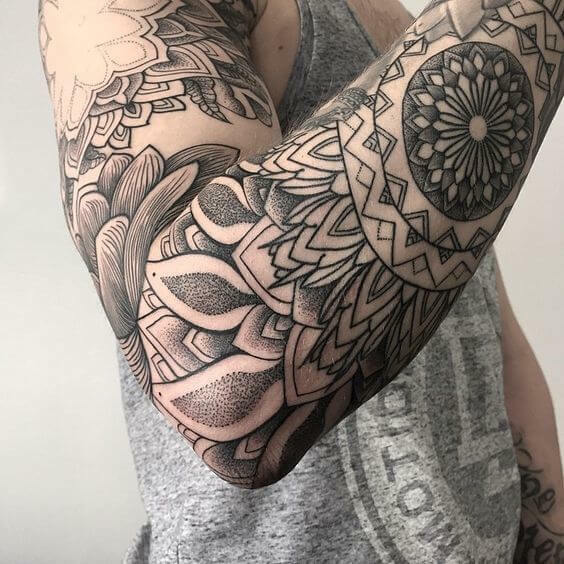 Another reason is that mandala tattoos have this contrast to them that represents feminine energy with the flower-like variations as it expands from the center while balancing it out with a very masculine focus on the square shapes incorporated in most mandalas – the representation of a perfect balance. These kinds of tattoo are usually appreciated by people who are drawn to spirituality. The versatility of the mandala tattoo is another reason they are so popular. They could be as simple or as complicated as the person wants them to be. Colors could be included although they tend to look better in black. 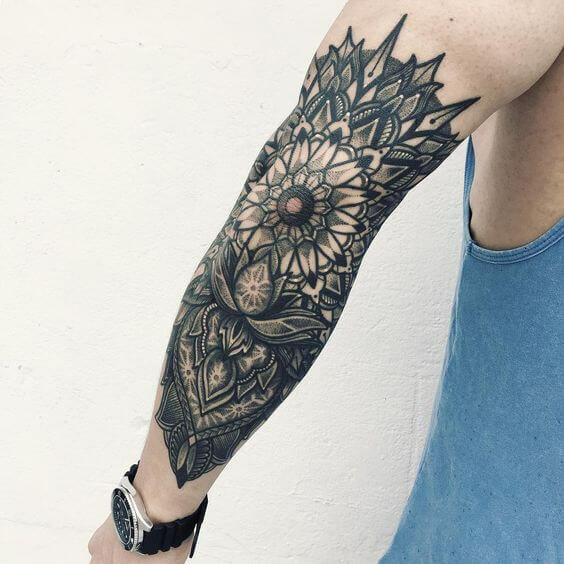 Mandala tattoos for men tend to be better appreciated if one can view the whole design at first glance making them suitable for the areas like the back. Mandala tattoos are an indication of character strength and belief in the spiritual. Their popularity also stems from their ability to express individuality and strength of character. Due to its versatility, mandalas can be incorporated into many tattoo designs. Find one that appeals to who you are. Then consult an expert tattoo artist with an eye for detail before settling down and getting a mandala tattoo. Find someone who can bring out the intricacy and depth needed to bring this design to life. 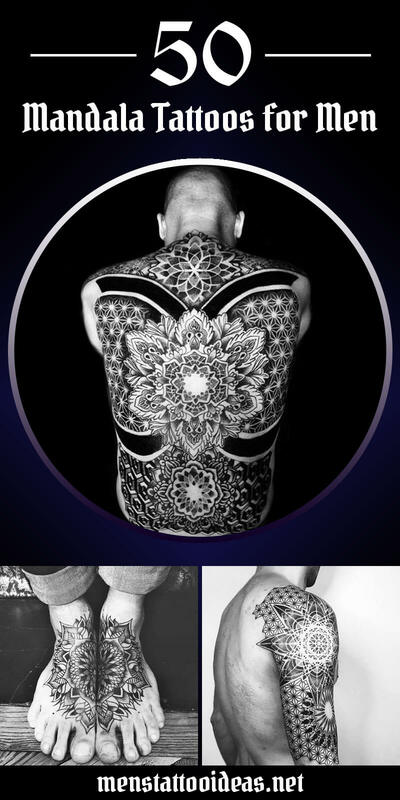 This version of mandala tattoos for men depicts a flower mandala on a man’s forearm – a perfect place for a tattoo. The design is done just right, with the pattern drawn symmetrically as it should be. It is done entirely in black ink, with faded parts done like on a painting. Forearm tattoos, when done right, are beautiful, and this picture is showcasing just that. 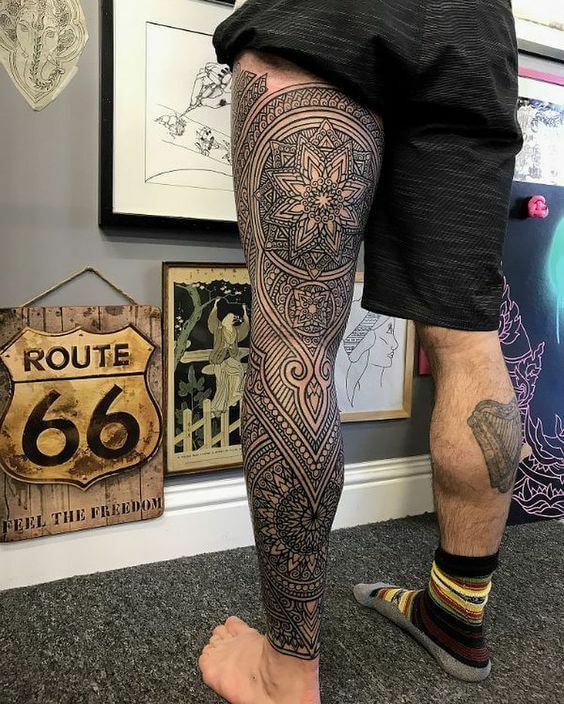 Full-leg tattoos are maybe not as popular as sleeve tattoos but can be even more beautiful when done right, and this picture is the exact proof of that. What we see here are two mandala patterns combined into one beautiful artwork. The artist must have spent countless hours working on this perfectly done tattoo. Amazing. Wow! You can rarely see a combination of two popular tattoo ideas. This is one of the more creative mandala tattoos ideas for men. What we see here is a skull tattoo design, which continues into a mandala pattern from forehead up. Basically, the entire upper part of the skull is turned into a beautiful mandala. Everything is done in black ink, and the design is spot-on. Astounding. Here we have not one, not two, not three, but four different mandala designs combined into one beautiful whole. 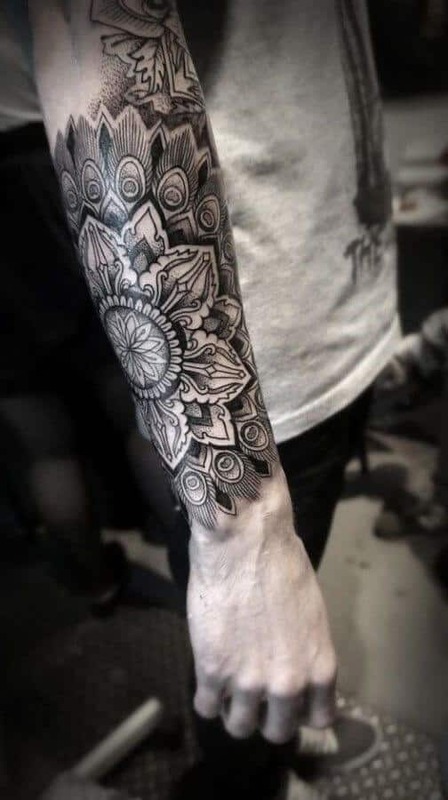 Whoever thought of combining a flower mandala, a compass, a snowflake and a regular mandala into this sleeve tattoo must be a genius. Not only is the tattoo done flawlessly, but the bold black ink itself gives it even more strength. 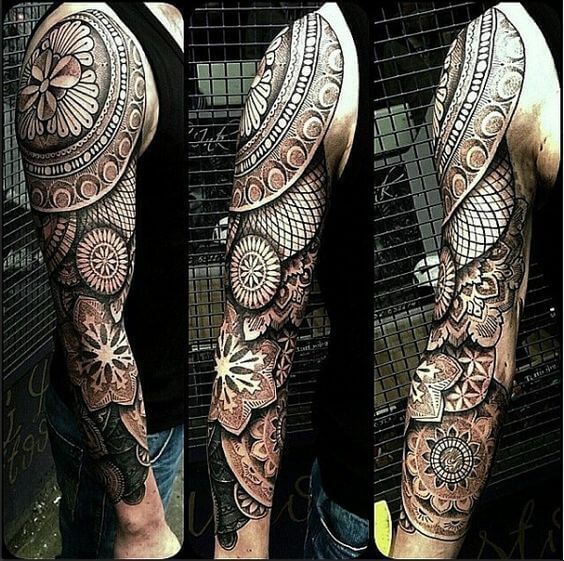 Sleeve mandala tattoos for guys are a perfect choice and this short sleeve mandala tattoo is no exception to that. The combination of two flower mandalas is perfectly done. It takes a special kind of talent to pull of the right combination of bold and faded parts. 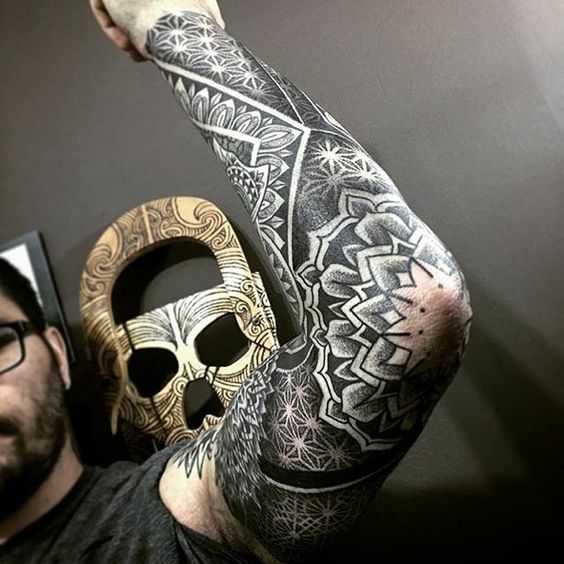 This tattoo is among one of the best mandala tattoo ideas for men for a good reason. Using the tip of an elbow as the center of a mandala pattern is not only extremely creative, it is genuinely beautiful. 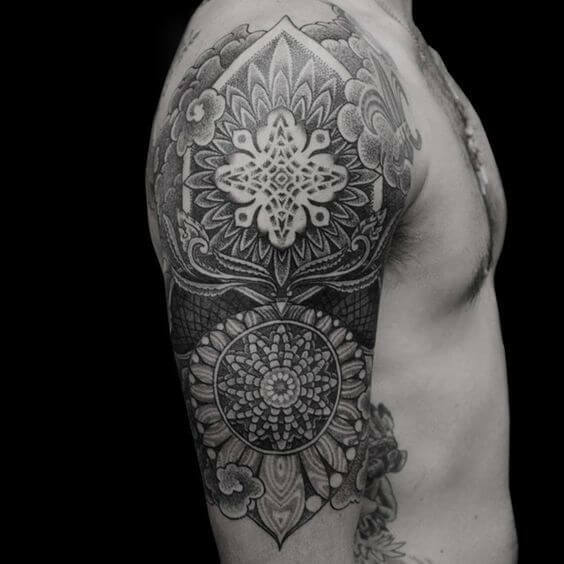 Using a combination of two flower mandalas has proven to be a great mandala tattoo idea for men. This picture shows how beautiful a flower mandala can be when you use its petals as a bridge between the two of them. The bold flower petals give this tattoo some special strength. 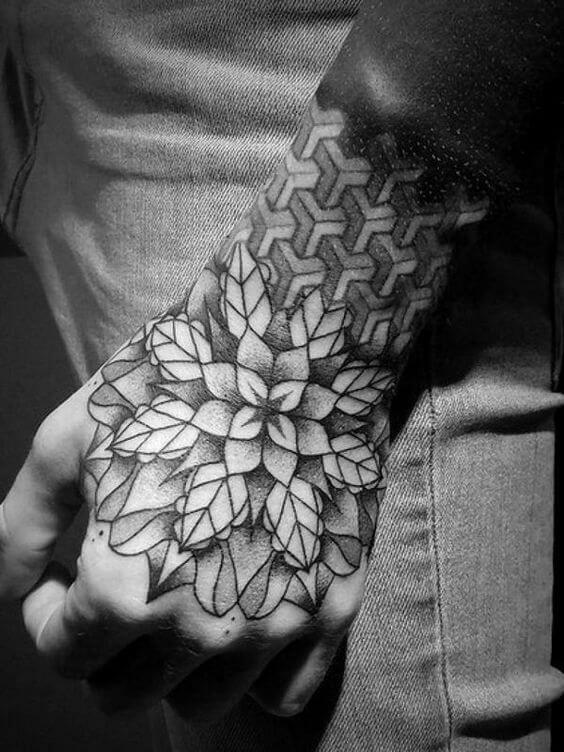 Tattoo artist: “What do you want?” Customer: “How about that flower mandala, but just on my hand?” Tattoo artist: “Say no more.” Brilliant. 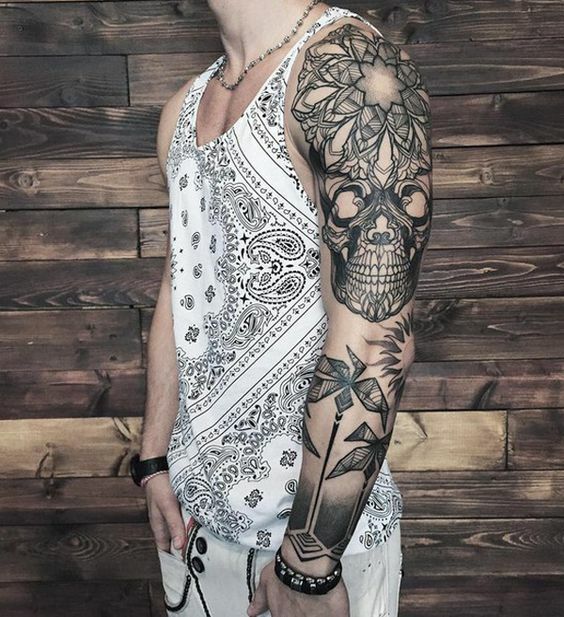 Every man’s dream is a great sleeve tattoo, it’s just that some men aren’t willing to admit it. And what better sleeve tattoo idea than a mandala tattoo? This image depicts a beautiful flower mandala done in combination with some additional flower symbols. Work of an artist, indeed. 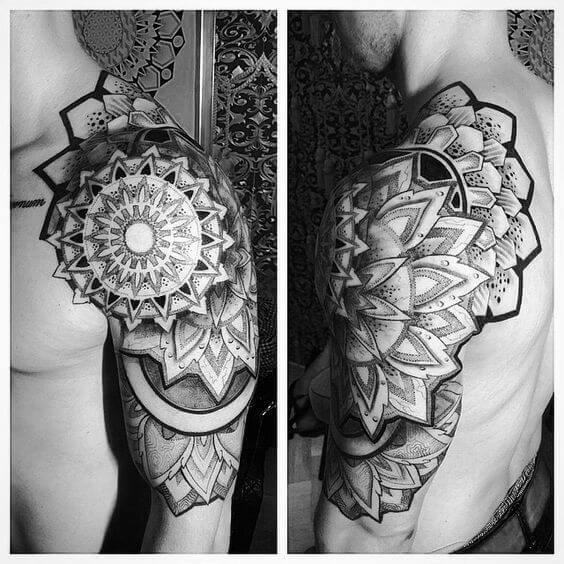 Here’s a perfect shoulder mandala tattoo. If you’re having trouble going through tattoos ideas, search no more. The symbol is a sun mandala, done brilliantly all the way down to the elbow.